The Timken Company developed roller bearings for railroad use. Their products offered major reduction in friction. To promote their use, they had Alco build them a 4-8-4 steam locomotive equipped with roller bearings throughout. They loaned it to a series of railroads to try in service. While the Timken 1111 “Four Aces” locomotive is a story itself, my focus is what happened to it on the NYC? Where on the system was it tested? Did it change management’s thinking? The NYC was the first of 13 railroads to try this 4-8-4. They made 44 freight runs with it before turning it over to the next railroad. This was 1930 and many excellent NYC Mohawks were already proving themselves very capable across the system, so apparently the powers that be were not all that impressed. There are very few photos showing this locomotive, and I’m not sure any of them show it in service on the NYC. One photo taken in Terre Haute, Indiana struck me as a possibility. The locomotive still looks fresh, has its original 4 air horns, but has no train tied to its tender. Trouble is there were at least four railroads at Terre Haute, so one can’t be sure it was the NYC. A photo of Duane Yard in 1930 shows a coaling tower, but it does not match the one in the locomotive photo. I asked the NYC Historical Society if they had any record of the Timken locomotive in service on the NYC. I was sure there might have been an article about in the NYC magazine. I was told they had no information. The locomotive in striking green paint with its melodious air horns must have attracted attention wherever it went. Surely there must have been newspaper articles written about it. Unfortunately, because I currently reside in Europe, I have limited research resources. Any information you could add would be appreciated. There isn't much on the web, is there? I remember seeing a publicity photo from Chicago showing three pretty young ladies pulling her. That was in a book or magazine long, long ago. Try searching Northern Pacific 2626 and see if you get more that way. I wonder what data the ("NPRHA") Northern Pacific Railway Historical Association might have available? It's a shame it wasn't saved from being scrapped. It ran a few "End of Steam" excursions and a couple times on the "Casey Jones" trains here in Western Washington before being retired. I have no knowledge of its operation on the Central. Wish I did, it was a beautiful locomotive. There is plenty written about the Four Aces, but virtually nothing regarding its service on the New York Central. SKF entered the locomotive game in October 1931, when the New York Central put an Alco 4-6-4 into service with SKF bearings on all engine and tender axles. SKF bearings had been in use in passenger cars since the early 1920s; the first application to a locomotive was to the truck of a New York Central 4-6-2 in about 1927. Unfortunately, even after the Four Aces concluded its national tour, the actual incorporation of roller bearings was a slow process, with only three lines ordering any installations by 1934 because of the lingering effects of the depression. These included a Pacific on the D&H, two Hudsons on the NYC, and two Northerns on the DL&W. After 1936, however, the majority of new locomotives, slated for long-distance high-speed service, would include roller bearings, at least for drivers and truck axles. The first trial was a prosaic one, a 125-car freight drag on the New York Central Railroad. Page 100 includes a photo showing three young women in high heels pulling the Timken Four Aces. This was staged by the Pennsylvania Railroad in Chicago on August 7, 1930. 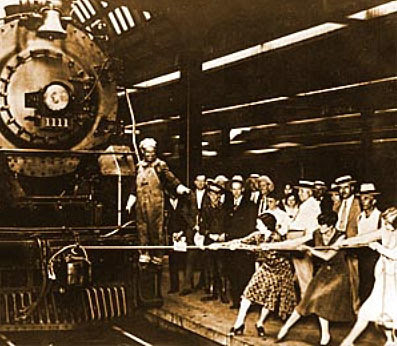 The spectacle of three people – women or men – moving a huge locomotive made for great publicity. But railroad executives were most interested in the mundane operating statistics of the Four Aces. After 100,000 miles of operation in service to fourteen different railroad companies, there was a lot of such information available. The Four Aces consumed less fuel and water yet was far more powerful than comparable engines not equipped with anti-friction bearings. The cost savings on maintenance and lubricants in a single year was nearly enough to pay for the initial cost of the bearings, which had a life expectancy of three years on driving axles and six years elsewhere. The Four Aces demonstrated its capabilities on long hauls and steep grades under all conditions, and at the same time Timken bearings proved their worth by running trouble-free with only minimal maintenance. Kurt Moose, Hardcoaler and Hytec like this. Thanks Mike, that's interesting. I remember seeing the publicity photo of the three ladies many years ago, possibly in Life magazine. 1111 was an impressive machine from the photos returned by Google. I have a copy of three ladies pulling a NY Central Niagara if anyone is interested. Yes, let's see it Fitz! dualgauge, ddm502001, Kurt Moose and 2 others like this. Jim, that's wonderful nostalgia. Thanks for sharing. This must have been a popular publicity shot. Here's another bevy of gals pulling the 1111.
dualgauge, ddm502001 and Kurt Moose like this. That newspaper clipping says there was filming going on as well, and shown in theaters . Anyone seen that? Model of Four Aces (because the photos of the prototype are all in black and white). dualgauge, Kurt Moose, ddm502001 and 1 other person like this. The new locomotive was painted dark green with gold stripes. Officially named TRBX 1111, it was known as the Four Aces. The numbers on its sand dome and headlight number boards were mounted over the shapes of a heart, a diamond, a spade, and a club. Also notice the four air horns. They were Wabco AA-1. The pair facing the rear were straight; the pair facing forward were curved to the left. These were commonly used on interurbans of the period. Delaware Lackawanna and Western ordered similar Northerns from Alco about the same time the Four Aces was built. Here is a link to a video with original soundtrack. It is interesting in that all these locomotives were equipped with Wabco AA-1 air horns. You can hear them in the video. Kurt Moose, ddm502001 and Hardcoaler like this. Mike, thank you for finding and sharing two wonderful videos. Yes, thanks Mike. Sure miss them. Four Aces began its service on Line East of the NYC making 44 runs exclusively in freight service totaling 6,582 miles between April 4th and May 21st, 1930. April to May 1930 – NYC trials of Timken 1111 with roller bearings throughout. November 1931 – Hudson J-1e 5344 was built new with Timken roller bearings on all engine and tender axles except pony truck wheels, which were SKF, and trailing truck which were conventional brass plain bearings. Side rods and valve gear parts were also brass plain bearings. Hudson J-1e 5343 was also built new with SKF roller bearings on all engine and tender axles except trailing truck, which were plain bearings. Side rods and valve gear parts were also brass plain bearings. September 1937 – First J-3a Hudson built new with roller bearings on all wheels, engine and tender. Side rods and main rods were still equipped with plain bearings except 5450-5454 had Timken roller bearings. Timken roller bearings on engine trucks and SKF on Commonwealth-built tender trucks. March 1945 – First Niagara built with roller bearings throughout. It took 15 years for the New York Central to fully implement the advantages of roller bearings. Kurt Moose, Hytec and Hardcoaler like this.